What is the allure of secondhand books? Why do so many of us enjoy sorting through other people’s discarded reading material? If you’re anything like me then you’ll find it impossible to come away from a secondhand bookstall empty-handed. And we’re not alone – more and more charities are opening shops that sell only books. Oxfam also sell them online. So do these shops attract us because we like a bargain? I think there’s more to it than that – after all I don’t enjoy rooting through the donated blouses and shoes in a charity shop. Is it because, unlike a slightly used skirt, a secondhand book can give us the same experience as the new version? Possibly, although new books (like a new car or a new carpet) have that unbeatable ‘new’ smell and that’s part of their attraction. Some older pre-read books can have a slightly less attractive odour. I think the excitement of ferreting through a secondhand book shop is the journey into the unknown that it offers. The books might be jumbled up or loosely grouped – but you never know what you might find! It could be a favourite classic from your childhood, a recipe book used by your grandmother or the latest best-seller. The secondhand book shop experience is totally different to the well organised High Street book chain where everything is in its place and the staff can consult the computer and tell you instantly whether something is in stock. I now have a bookcase groaning with books. Those that I’ve really enjoyed I pass onto friends, the others find their way back into the perpetual charity secondhand book cycle. I have sold the odd one on Ebay but found that it wasn’t worth all the hassle for the amount of money generated. 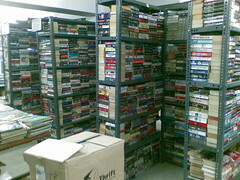 But if you have a real mountain of books and would like to try and make some cash out of them (maybe to buy a Kindle?!) have a look here for some tips on how to set up a bookselling business. This entry was posted on November 7, 2011, 11:00 am and is filed under Books. You can follow any responses to this entry through RSS 2.0. You can leave a response, or trackback from your own site. We often go car booting. I always come back loaded with books. There are such bargains. Then again I can’t resist the library either. I picked up Georgette Heyer’s biography the other day. It’s great. Great post. Susan – I’m a glutton for the library too and often end up taking books back unread because I just didn’t find the time!